Today will be Steph's last day with us as she is setting of on a new adventure in Lexington Kentucky. She was part of our faithful 6:30pm crew. Always smiling and full of fun, we will miss her but are excited for her as she launches into a exciting new adventure! Having a Little Fun After Class...Do We Really Ever Grow Up? Two Boy's Pushing To Make Each Other Better! Do you have someone that pushes you?...Tyler and Ryan can be complete goof balls at times in class and sometimes we even have to add some extra burpees to get all the goofiness out of them for the day. But when that count down begins and the buzzer goes off these two battle every time to see who is going to post the top score or best time for the day and that is something that brings a smile to my face because I know that they are making each other better. Sometimes athletes are told it's all about participation and having fun and that in some way competing is almost frowned upon. As we get older, we sometimes forget that competing can be fun and very beneficial in so many ways. We are never too old to set goals and make improvements to our quality of life. Competing can be a great tool to help you get there, so ask yourself if there is someone in the box that you enjoy training with and that pushes you to get better. Facebook that person, talk to them after class, text them, whatever it takes to get on the same schedule to train together. After that be consistent, work hard, have fun and COMPETE, then sit back and watch yourself reach heights you didn't even think possible! The Steadily Expanding 9:00am Group Has Been Getting Very Consitent!! Can't Wait to See As The Summer Moves Along All The Hard Work Pay Off For These Athletes! 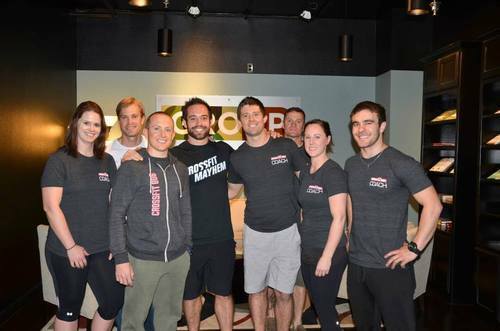 CrossFit's continued growth, a great video to watch! We are going to be making two changes to the 5:45am class starting next Monday April 14th. First off to make room for a group of athletes starting at 5:00am we will be moving the 5:45am group back to 6:00am. Second we are suspending the Wednesday 5:45am class until further notice. More then likely when the demand returns for this slot over the summer we will bring it back. 1). 5:45am will be moved to 6:00am starting Monday April 14th. 2). No Wednesday 6:00am classes until summer. Got to love spring...Beautiful sunshine and motivated athletes. Holden has been working very hard the last few months, preparing for his first CrossFit teen competition called the Gauntlet coming up this weekend. He will be competing against teens from around the Northwest and we are so excited to see how he does! There is a group of BCF members going up on Saturday night and or Sunday morning to cheer him on, so if you are looking for something to do or need an excuse to go for a nice drive and get outside please feel free to come support Holden as he represents himself and our affiliate. Good luck man...Your going to kill it! Sport - 2 RC / 24"
Athlete - 1 RC / 20"
Competitive - 2 RC / 24"
Sport - 2 RC / 20"
Athlete - 1 RC / 16"
*Athlete chooses how they want to break them up. Part of the often overlooked EARLY morning crew! This proves that you can have fun at 6:00am! Although Ryan might still be a little slow to get his smile ready for photo shop this early:) Thank you for all your hard work guys! Also congragulations to Angela on her first rope climb this morning! She works so hard and has come so far! We love watching athletes do things they didn't think possible!! Reminder...There is only three spots left for the summer athletes camp, so if you have a son or daughter looking to gain an edge for the upcoming sports seasons, please RSVP before it's too late! 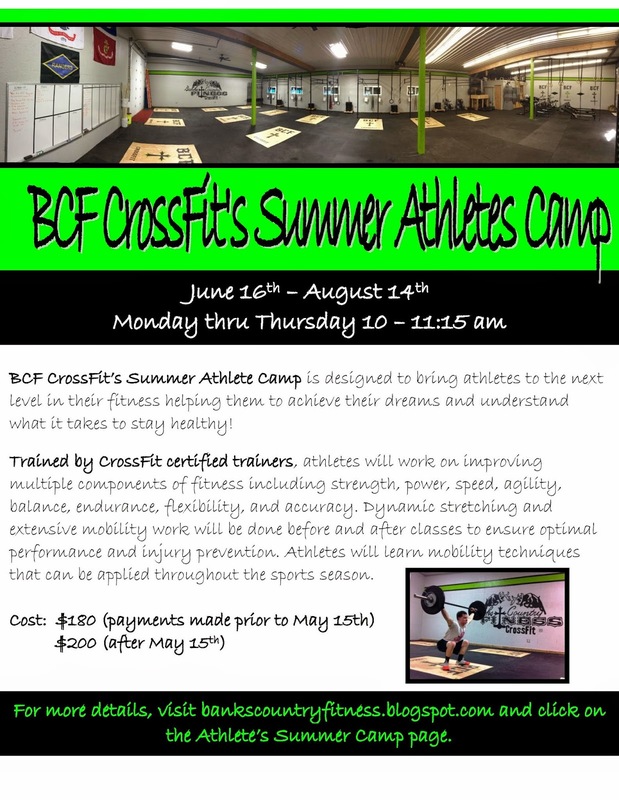 We are excited to be offering an awesome opportunity this summer for fifteen people to make some big changes with our "Get Your Body Back" camp. We have been working incredibly hard to put this together and are really excited to see peoples results. You can find all the details on our website under the "Get Your Body Back" tab. 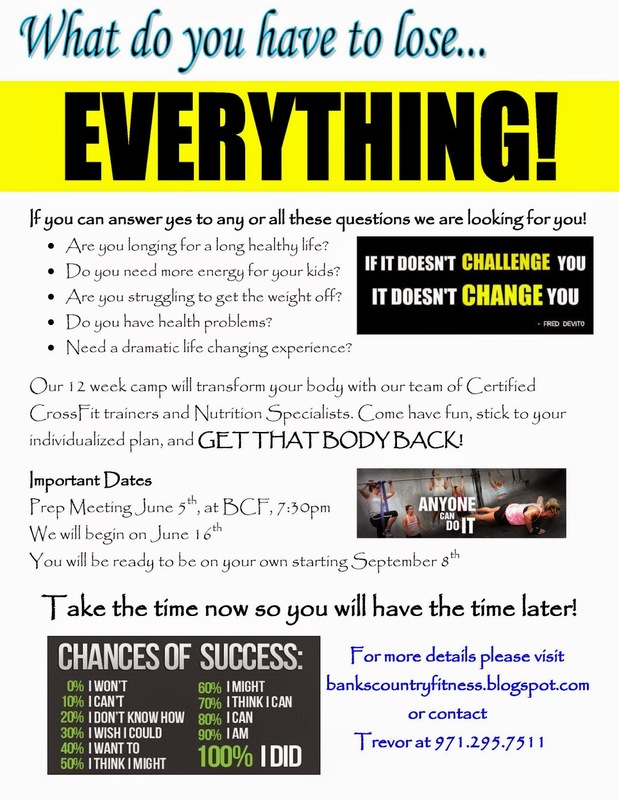 This camp is for people truly committed to losing serious weight and are willing to put the work in to make it happen. In addition to working with our awesome staff, we are bringing in a Nutrition Specialist to work along side Bethany for the summer (I will be sending more information out about her later:)...This is not just a tutorial on Paleo or Zone and then we let you loose. This is us tearing through your nutrition, providing individualized meal plans, shopping lists, specialized programming, weekly consultations, depending upon your needs, plus a lot more. This is you saying that you are truly committing to losing some serious weight over the summer! There is a lot to this camp but the results will be awesome! So please take a look at our website and please feel free to contact me with any further questions. Space is limited for this camp and will fill up fast! To do this correctly we are capping this camp off at 15 athletes. If you know of someone that REALLY needs to and WANTS to make some lifestyle changes please pass this along! This is actually a group of Three!! Can you spot the third? You have to look close, she has been working hard and is doing awesome at keeping healthy and vibrant. Although these two are so fast their blurry they actually didn't have the fastest time of the day! That honor goes to Steve and Kevin...Nice work gentlemen! Dana got the privilage of teaming up with the "Buxton Beast"
What an inspiration this years Open competition was for me as an athlete and as a coach. I watched athletes pour their hearts and souls into these WOD's and it was an honor to be a part of it! Not because any of us were planning on competing for the title of Fittest On Earth but because I watched athletes do things they didn't even think possible. They pushed themselves to their limits and have now realized they can do so much more. As a coach it was a friendly reminder for me of the importance and power threshold training has in the world of fitness and CrossFit. It also re-kindled my passion for as an athlete; it made me take a step back and question my own training. Have I been really pushing my threshold? Or have I just settled at RX and a solid time, put it on the board and called it good for the day! Did you really push as hard as you could today? When I watched people walk away from each of the Open WOD's over the last five weeks I saw gassed athletes. Not hands on my knees breathing deep, but truly spent! Laying on the ground like a floppy fish making very honorable sweat angels. We were all fine twenty minutes later, but I knew after each WOD that they had pushed their threshold and looking back now I just wonder where their/my fitness could be in 6-12 months if we could hit that intensity on a consistent basis? Do you remember that first time you tackled your first WOD? You know the first time that you really put it all out there and found yourself staring at the ceiling wondering what just happened? If you aren't getting the results you want take a look back over the last few months and see how often you are really pushing your threshold. If your honest with yourself, then you know what must be done...Get back to making sweat angels and don't be to cool to be a floppy fish:)...THANK YOU to all of the athletes that competed with us this year! It was an awesome thing to be a part of! !